Your tour begins at the Tourist Information Kiosk on Pagoda Street (next to Srim Mariamman Temple), where you will meet your expert local guide. Together with your guide, walk along the narrow streets between traditional pre-war shop houses and let your guide recount stories of Chinese migrants who left China and settled here in search of a better living. They worked as coolies during colonial times and stayed in the upper floors of these shop houses, sometimes with as many as 10 people in one small room. As you move through the five-foot-ways, rediscover the old trades, such as woodwork, traditional Chinese medical halls, tea houses, calligraphy galleries, and bakeries that are still plying their trades here today. Immerse yourself in the bustling streets as your tour guide shares the origins of street names with you, from Pagoda Street to Smith Street, Waterloo Street to Terengganu street. Before long you will find yourself at the local wet market and cooked food centre. Step into the basement wet market where vendors peddle fresh fruits and veggies, sauces and livestock. Proceed to the upper floors where a congregation of local cooked food hawkers churn out yummlicious local dishes. Tease your tastebuds with a sampling of local biscuits and snacks. End the tour with visit to the Sri Mariamman and Buddha Tooth Relic Temple, located on the same stretch of road – a testament to Singapore’s multi-cultural and multi-religious society. It is here that you bid goodbye to your guide and fellow walking tour mates. As it is half past noon, why not pick a restaurant that catches your fancy and sit down for a local lunch. 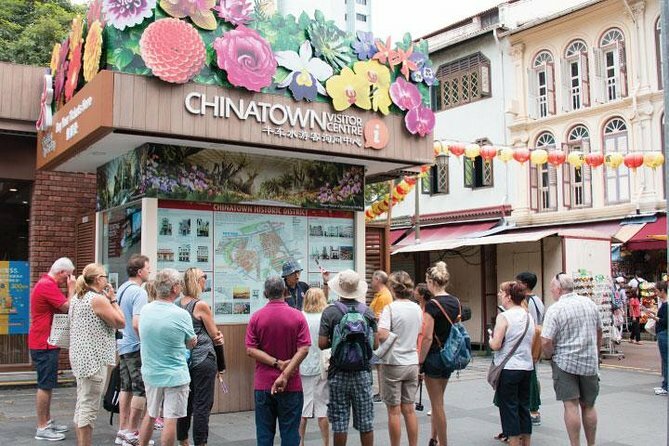 • Expert local guide to show you sights in Chinatown which you may have otherwise missed touring on your own.